The price of the book when it left the printer’s workshop was believed to be about thirty florins, equivalent to a clerk’s wages for three years. But as she lifts it out of the last of the wrappings, the Bible appears to be fine. For an expert like Robert Schad, there is no mistaking the original 15th-century binding of age-darkened brown calfskin stretched over heavy wood boards. The copy now in Estelle Doheny’s possession is the first issue of the first edition of the first book printed with movable metal type, in near-pristine condition, its pages fresh and clean. The lozenge and floweret patterns stamped into the leather cover are still sharp and firm to the touch. Five raised metal bosses protect the covers, one ornament in the center and one set in an inch from each of the four corners. Two broken leather-edge clasps are the only reminders that this book, which has presented the Living Word for nearly five centuries, has been opened and closed often enough to wear down the heavy straps. The first owner of this Bible had not scrimped on ornamentation. The volume is filled with elaborate, richly colored illuminations and enlarged capital letters. In the upper left corner of the first page, a large capital letter F is painted in bright green and gold with ornaments of green leafy vines and tiny, bell-shaped flowers that trace the outer margin. The intricate foliage sweeps down the page and across the bottom, where in the far right corner the artist added a white-bellied blue bird with a bright yellow beak. Such imagery stands in delicate contrast to the enduring richness of Gutenberg’s type. Jet-black and lustrous, the ink shimmers as if the pages were just recently printed, a quality that was long one of the great mysteries of Gutenberg’s art, a hallmark of the Bibles he printed in Mainz, Germany, before August 15, 1456. Most scholars believe that Gutenberg produced about 180 copies, and among these, most likely 150 were printed on paper and 30 on animal skin known as vellum. The price of the book when it left the printer’s workshop was believed to be about thirty florins, equivalent to a clerk’s wages for three years. The vellum versions were priced higher, since they were more labor-intensive and expensive to produce—a single copy required the skin of 170 calves. Hers is perhaps the most beautiful of the surviving paper copies. Despite its age, this volume lacks no pages and has no serious damage. Designated as Number 45 in a definitive list compiled by Hungarian book authority Ilona Hubay, this Bible has clearly received special care through the centuries, or at least supremely benign neglect. Thanks to a strong US dollar and the recent devaluation of the British pound sterling, she has managed to secure one of Western civilization’s great artifacts at a bargain price. Gutenberg’s printed pages were usually bound in two volumes, and nearly half of the known copies are considered “incomplete” because the second volume has been lost. That is the case with Number 45, which contains the Old Testament from Genesis through the Psalms. But it is one of the few to retain its original binding, created in Mainz contemporaneously with its printing. The calfskin cover is decorated in a distinctive pattern of impressions. A lattice motif of small diamonds, known by bookmen as a “lozenge diaper,” surrounds six different stamps: an eagle, a trefoil, a eur-de-lis, and a seven-pointed star. Those details, and the cover as a whole, are in exceptional condition. Lucille steps aside so that Schad can gently steady the 15-pound volume for Estelle. Of all the bookmen who have come and gone during her decades of zealous acquisitions, none have meant more to her than Robert O. Schad, a trusted adviser in her quest, who for the past twenty years has hand-selected the items purchased to strengthen the magnificent “collection of collections” at the Huntington Library. Like Estelle, he is completely self-taught, educated through decades of direct contact with the world’s most important books and the famous dealers who trade them. He has always treated her with respect, and always welcomed her questions, no matter how unsophisticated. Schad signals his son to pick up the Kodak Duaflex twin-lens camera they’ve brought. Jasper rapidly snaps a half-dozen photographs, covering the bulb with a white handkerchief to protect Mrs. Doheny’s sensitive eyes. In one frame, Estelle holds the Bible, gazing down at its pages. As far as Schad knows, this is only the second time a Gutenberg Bible and its owner have been photographed together. 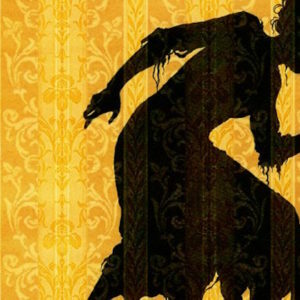 The day has become “boiling hot,” and the party retires to the mansion’s Pompeian Room. Beneath a twenty-four-foot-wide Favrile glass dome ceiling attributed to Louis Comfort Tiffany, the group fetes the Gutenberg Bible’s arrival with a luncheon whose menu Lucille saves for the ages: jellied consommé madrilene with crackers and relishes; fried chicken with hominy and hot biscuits; mixed-green salad and a platter of fresh peaches, pears, and persimmons; and a dessert of cream puffs and cookies, with tea served in glasses chilled with an abundance of ice. “I am keeping the book,” Estelle hurriedly writes Ernest Maggs, one of London’s revered book dealers, early the following morning. She dispatches a check for 25,000 pounds sterling, the equivalent then of $70,093. It is a check that she is delighted to sign. Thanks to a strong US dollar and the recent devaluation of the British pound sterling, she has managed to secure one of Western civilization’s great artifacts at a bargain price. With payment tendered, Estelle Betzold Doheny becomes the first and only woman to purchase a Gutenberg Bible as a private collector. Her deep need to own this holy book not only reflects her faith as a devout Catholic but also reveals her shrewd mind for the bottom line. She tells Lucille she has never felt richer or more content. The book is a panacea for the deep personal losses she has faced, and, she believes, it is a gift from God. It not only lifts her heart, it changes her very image of herself. 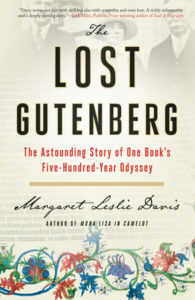 From The Lost Gutenberg by Margaret Leslie Davis, published by TarcherPerigee, an imprint of Penguin Publishing Group, a division of Penguin Random House LLC. Copyright © 2019 by Margaret Leslie Davis. Margaret Leslie Davis is a graduate of Georgetown University and earned her master’s in professional writing at the University of Southern California. Her award-winning books have been featured on Good Morning America, and in the London Sunday Times and Vanity Fair. She has appeared on C-SPAN Book TV and the History Channel’s Modern Marvels as well as on the Discovery Channel and A&E’s Biography. An experienced and sought-after public speaker, she has delivered addresses at many prestigious forums, including the New York Public Library, the White House Historical Association, and the National Gallery of Art.